New Season Pumps - Be Glossy In and Out! Since ancient times shoes are women`s obsession. Women love shoes because of the way they make them feel, not to mention they make women instantly taller and thinner. The right shoes can accessorize any outfit, casual or elegant. And as shoe size can rarely fluctuates with weight or age changing, it remains the best investment for a woman`s wardrobe. Lately, many women are hunting for the right shoes online because it is the most comfortable way of shopping. Sammydress offers the latest fashion styles and trends at the lowest wholesale prices directly to consumers all over the world. New season means new shoes. This fall/winter update your shoe collection with stacked platforms, transparent heels and on-points courts. 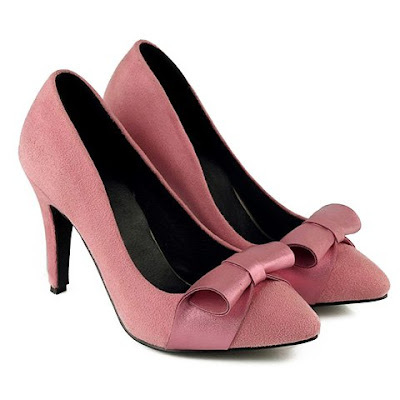 Pumps are one of the most popular styles of women's shoes, chic, classical and versatile. Pumps feature a heel regardless of the height, with a full upper, and finish in a rounded, pointed or peep-toe. Some have an ankle strap. Pumps go with everything, as Christian Dior used to say. For a casual daily look, a pair of neutral-toned can match perfectly your jeans and for an elegant evening outfit you can dare to wear strong colors or sparkling pumps. Every woman wears the shoes which are matching her personality, but some of the most important fall/winter 2015/2016 trends can inspire your style. Have in mind suede pumps, leopard prints, heeled-loafers, lace up footwear, gladiator style, leather faux snakeskin, geometrical patterns, metalic accents, glitter pumps, hairy/furry shoes, beaded or jewelled, studded punk pumps. Burgundy, pink-coral and white are the star colors of this season. Wear them with confidence. Here you can find more trendy designs at the best prices on the market. Treat yourself to a little shopping therapy. "Keep your head, heels and standards high!" Ειδικά τα 4 τελευταία είναι όνειρο!